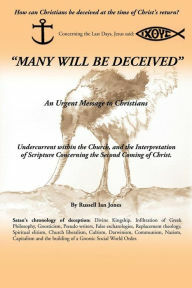 Many Will Be Deceived by Russell Ian Jones is an eye opening read that speaks of Jesus return, the Last Days and the co-mingling of false teachings, influences and interpretation of Scripture that has led to a widespread deception amongst Christians. His cover relates broadly what he focuses on, and as a Bible apologist, the author is one that is interested in science and history. Considering history and Scripture remains as the primary focus of his writings that abide by Biblical truth. Well-researched, this book also seeks to investigate Jesus claims that many false teachers will come. Within this, the objective is to instill a desire in the reader to seek the truth, the Holy Spirit and the absolute truth of Scripture. Additionally speaking of a false gospel that is preached and the Church at large that hides its head in the sand (thus the cover picture), teaching on such subjects as the Rapture, Evolution, the age of the Earth, the Great Tribulation, and much, much more make this book a great eschatological read that seeks to expose Gnostism, and many false teachings that have influenced the Early Church until now. The author begins from the start of the book by not discounting Satan’s master plan to deceive and corrupt Gods master plan for creation, as noted in Genesis. Consequently, three main scripture verses are the focus of the book (Matthew 24:10-11; Rev. 1-3; Rev. 2:7). The reader can look these up, but in summation these three scriptures speak of those, even the elect that will be deceived and that it is important to study and know what the Bible says. With that said, the last verse (Rev. 2:7) speaks of listening to what the Spirit of God is speaking to the churches. The author gives introduction to the Antichrist spirit that is within the world, but speaks that there is hope for the one that overcomes and endures. Giving an analyzation of the early writings of the Ante-Nicene Fathers, this book investigates the ancient writings that were in defense of Christ’s teachings during the first three hundred years of the Early Church. The author advocates that Christians would be wise to investigate what the undercurrent of certain theologies came from and to know their history and Bible in regards to Christianity. Offering a firm Biblical perspective, this book presents the teachings of Jesus as stated in the gospels and helps readers understand why many will be deceived and what sources of false teaching infiltrated and caused denominational division. A highly recommended read for all Christians to consider, ponder and understand the history and other influences that will bring them to their own research of Scripture, so they may know for themselves what the Bible says and what the Spirit of God speaks. A highly informative read and one the author urges every Christian to consider.